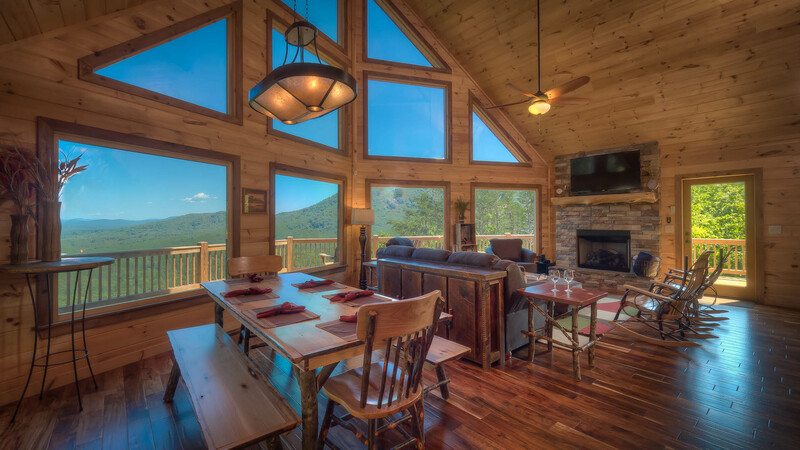 Are you looking for that exclusive, one-of-a-kind mountain escape that seemed like something you've only imagined? 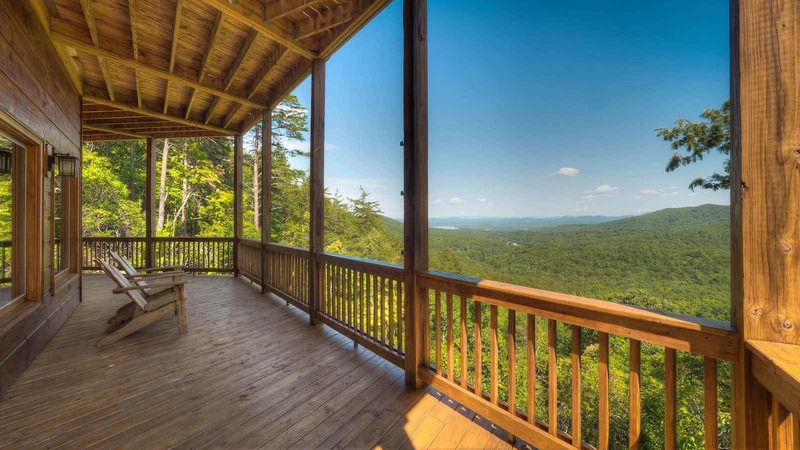 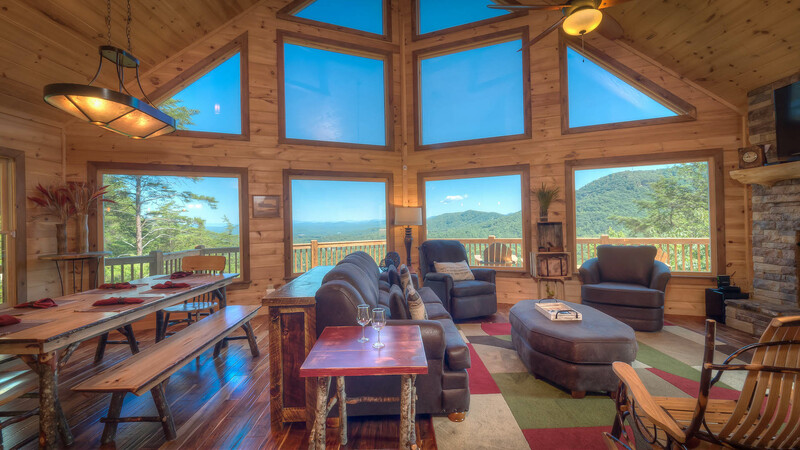 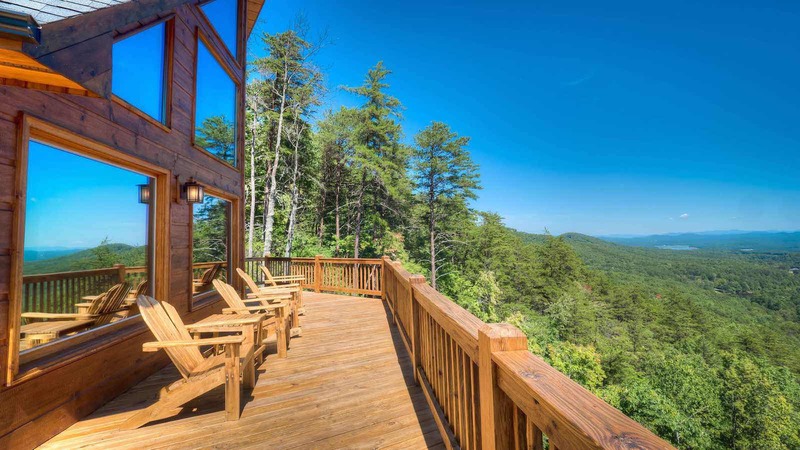 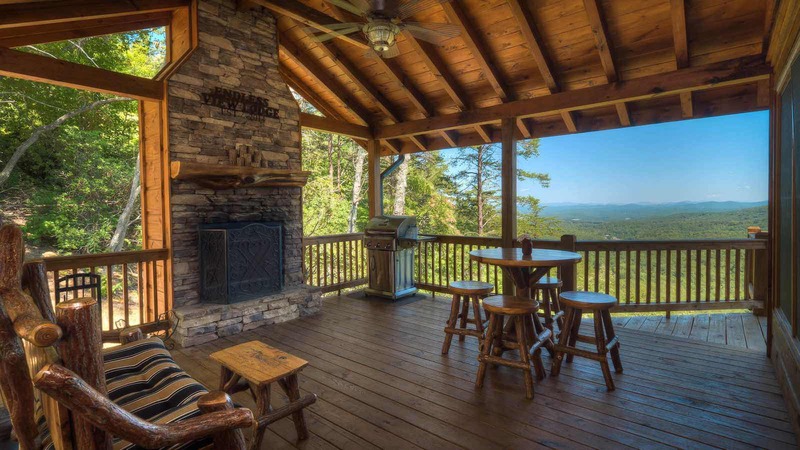 Endless View Lodge is a luxurious log home perched high atop the peaks of the Aska Adventure area in an endearing fairytale-like setting with absolutely legendary long range mountain and lake views. 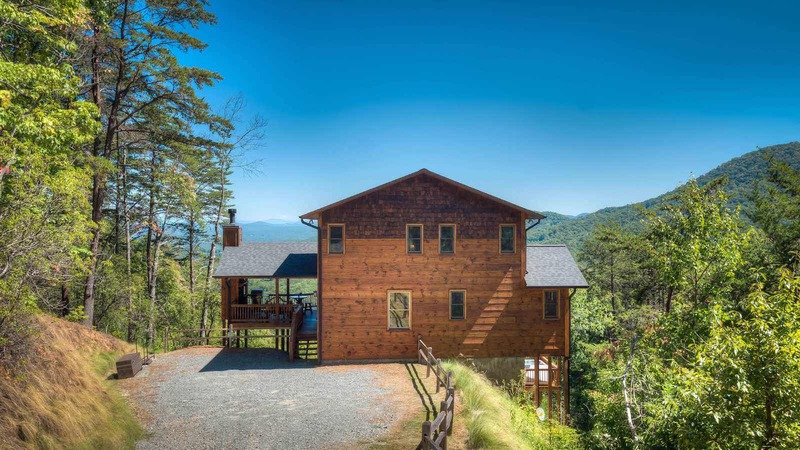 You'll feel as though you are entering a storybook when you make your way to the lodge, driving the gently curved road along the valley of Weaver Creek as you pass the beautiful countryside, streams, and rolling hills. 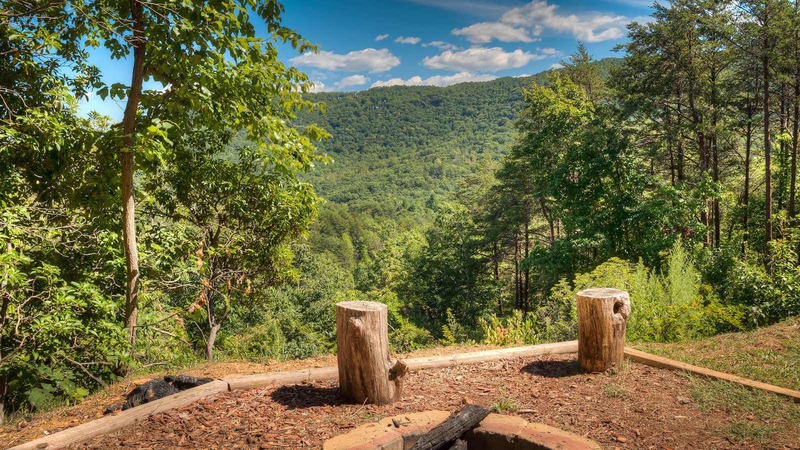 As you begin to embark on the adventurous climb in elevation in the last mile of your journey, you'll travel a winding, narrow gravel road up the mountainside. 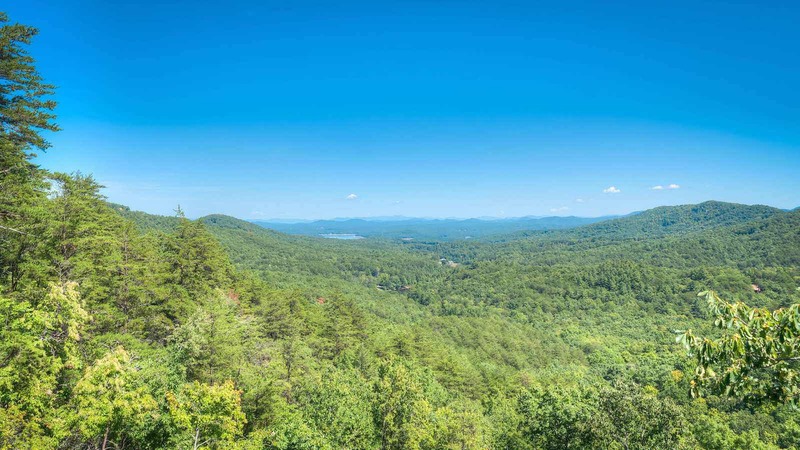 As you continue to drive higher, the views become clearer and you'll be able to see for miles. 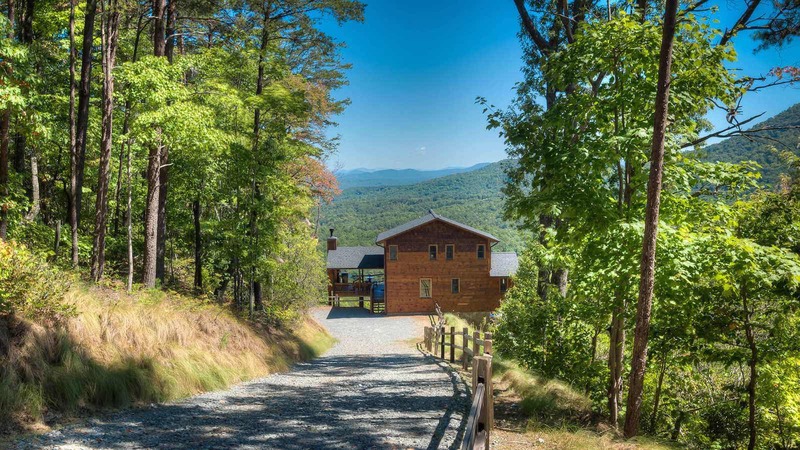 Just ahead, you'll make a left into the cabin's split-rail fence driveway and arrive to a gorgeous brand new lodge with spectacular long range views you won't even believe. 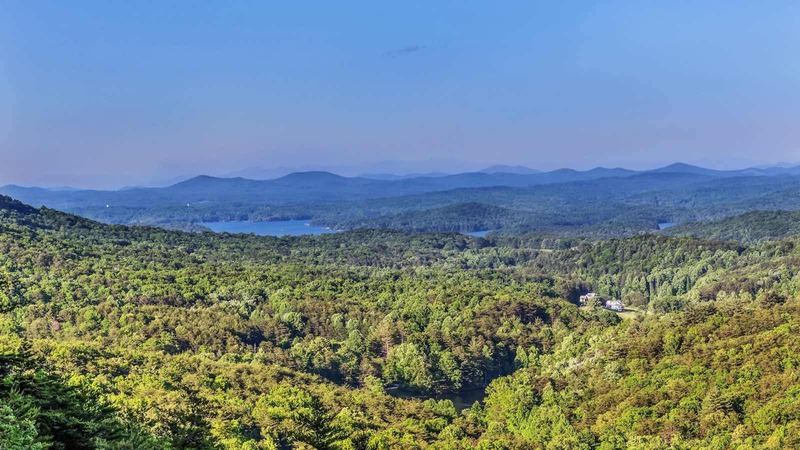 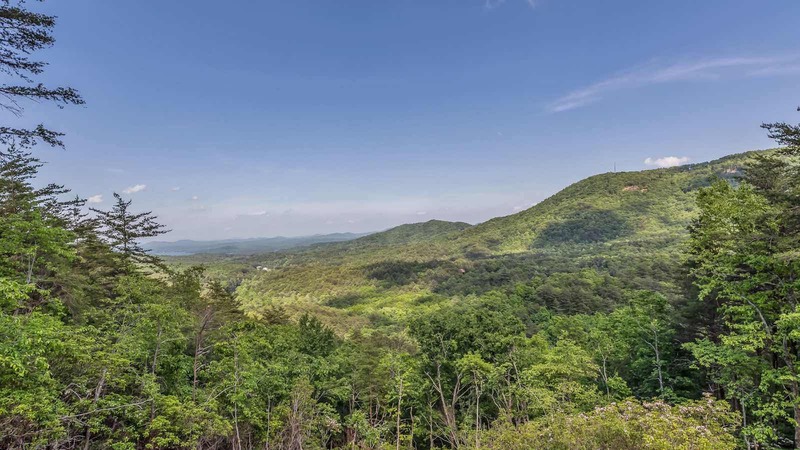 Though the last section of drive is steep, winding and narrow it is easily conquered by a few trips in and out to the various activities, restaurants, shopping, etc.. After all, you're only about 8 miles total from Downtown Blue Ridge! 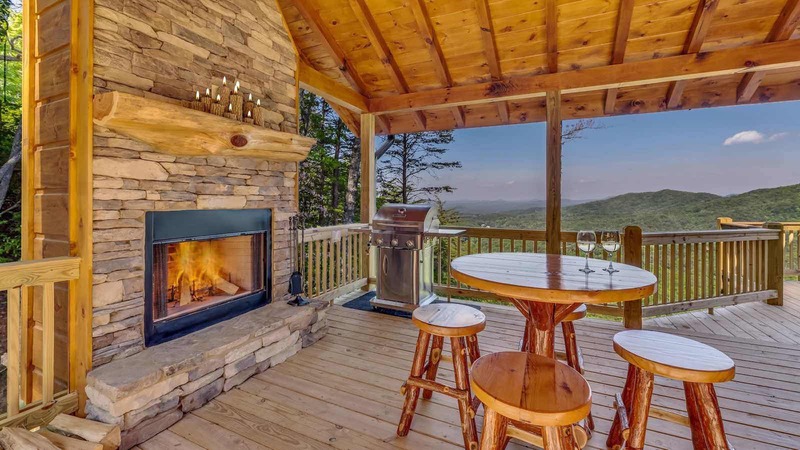 As you take the steps onto the deck, you'll discover a gorgeous stone outdoor wood burning fireplace on the main level's wrap-around deck. 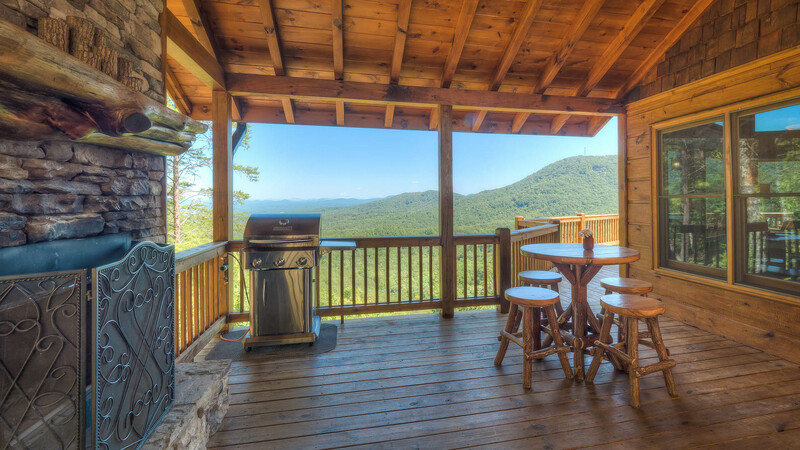 The main level deck fireplace is complimented by the gas grill and log custom made bar-style patio table and chairs. 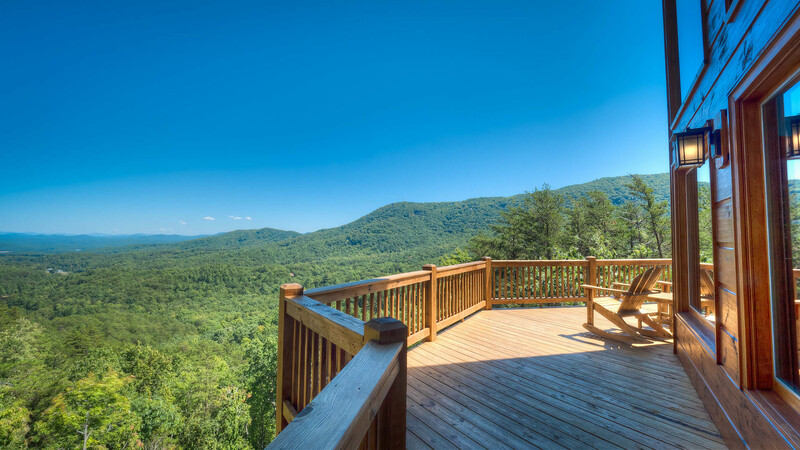 The deck continues on around the front of the cabin, offering an open deck ideal for sun-bathing, evening gatherings, or unobstructed views of the night sky for stargazing in one of the additional chairs placed here. 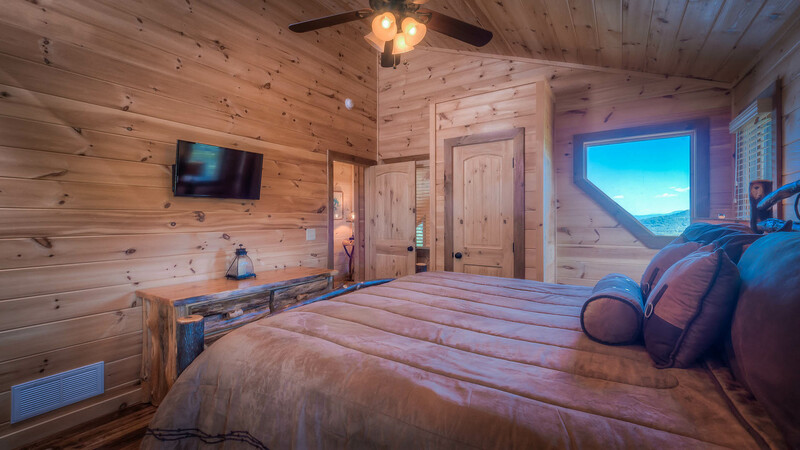 High end decor & furnishings, floor to ceiling windows, hand-scraped style rich dark floors and plenty of space are just a few things you can expect to see inside. 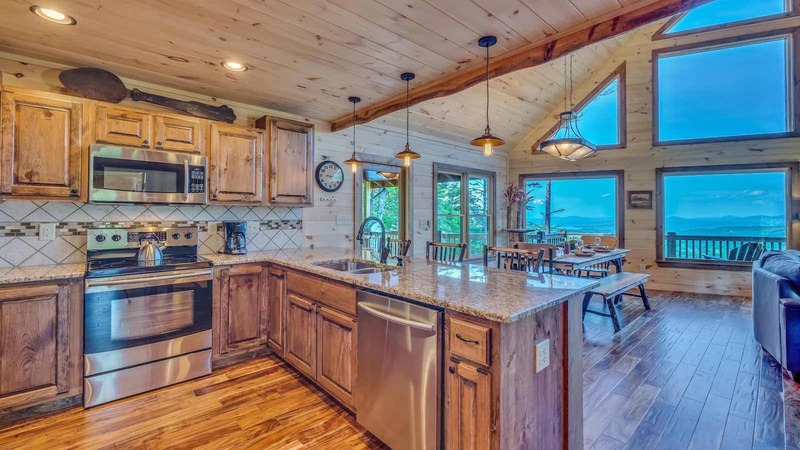 Revealed upon entry is the grand kitchen and great room with soaring ceilings, granite countertops, Edison-Style Pendant lighting, stone breakfast bar with seating for 3, gas log stone fireplace, Flat Panel TV, rich brown comfy sofas, and a custom made branch & log slab dining table. 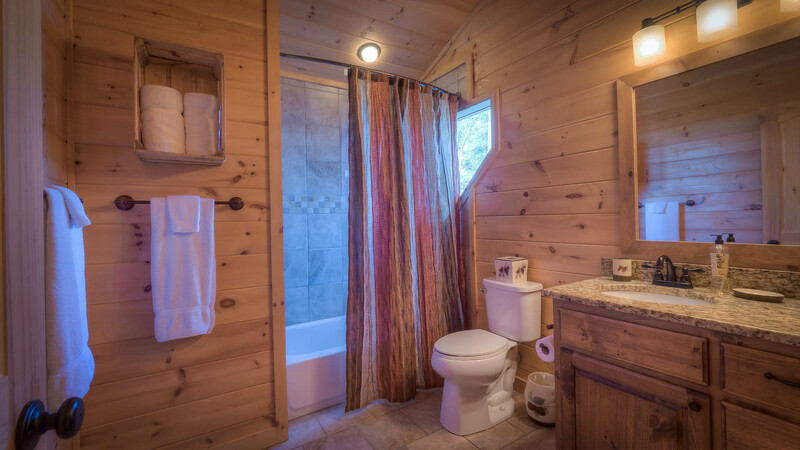 Just off the spacious kitchen is a half bath powder room and the door to the main level bedroom. 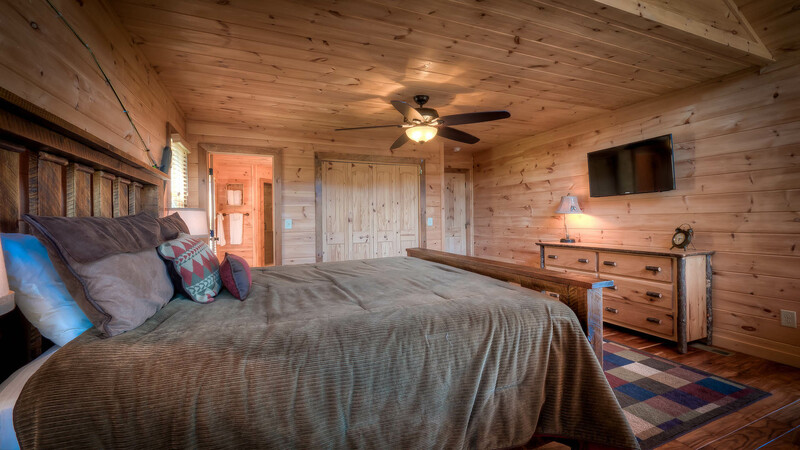 The main level bedroom offers a flat panel television with a separate enclosed glass door tile shower and granite counter top double vanity sinks. 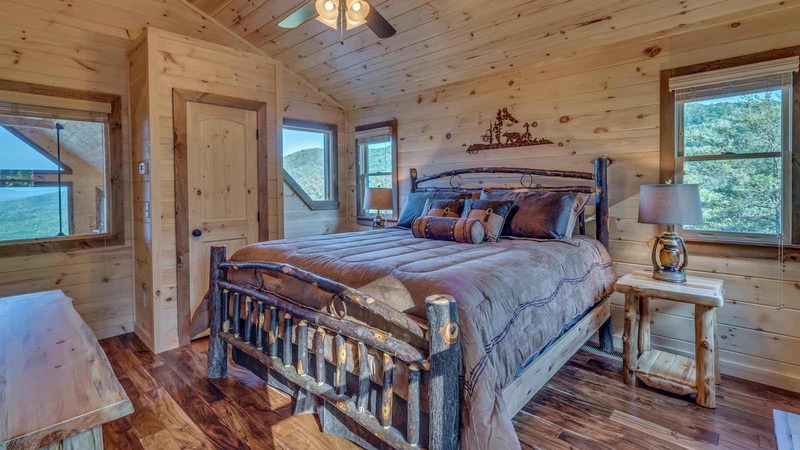 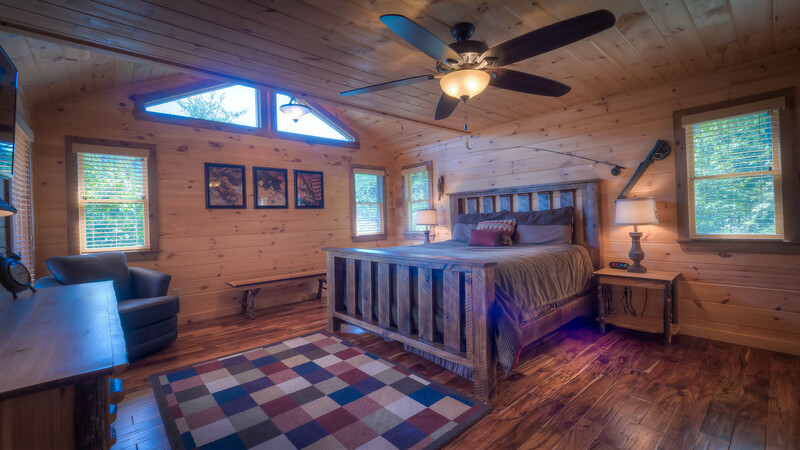 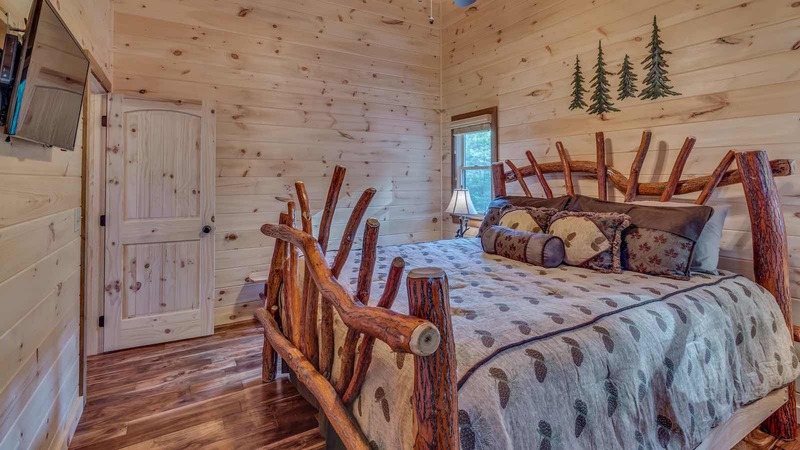 This bedroom also has a rough-sawn craftsman style king size log bed you'll fall in love with. 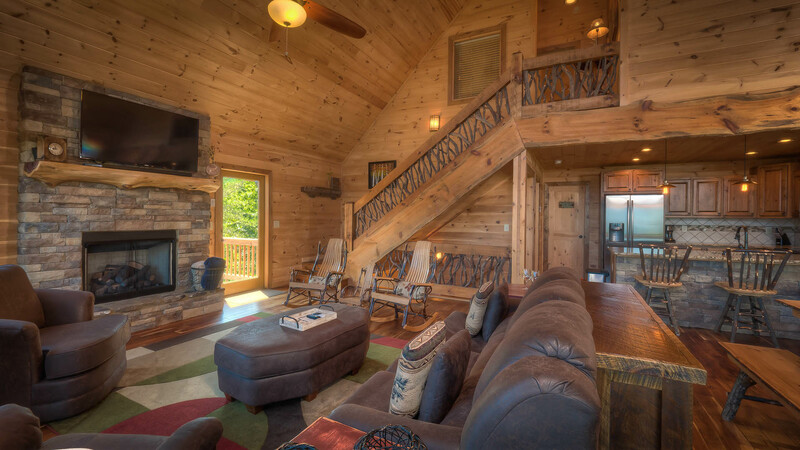 Head up the authentic reclaimed mountain laurel branch stairway with barn wood style steps to the upper level which has two bedrooms and a separate full bathroom in between. 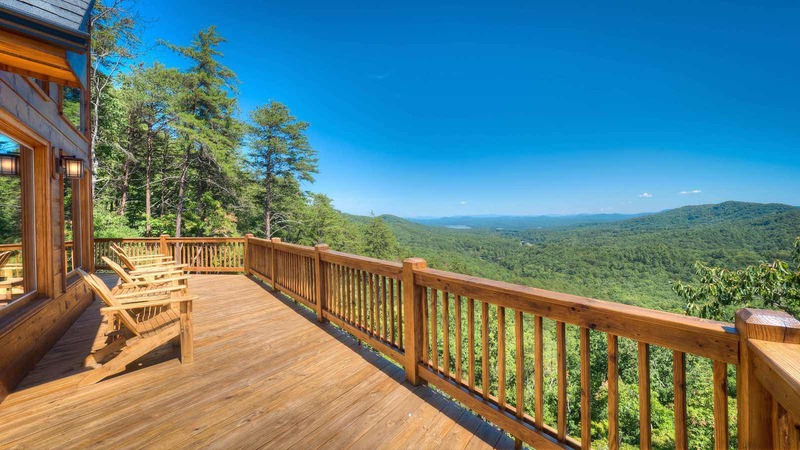 Careful not to trip on those steps; it’s hard to take your eyes of that incredible view as you make your way up the stairs! 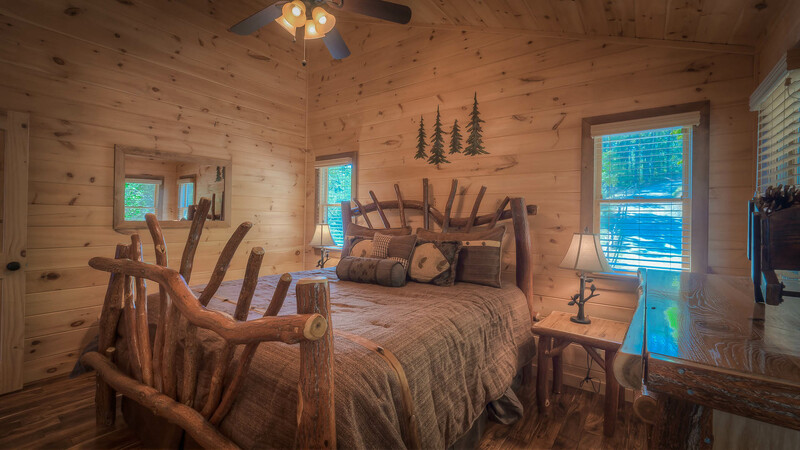 The upper level bedrooms will have unique log beds in each room as well as flat panel televisions. 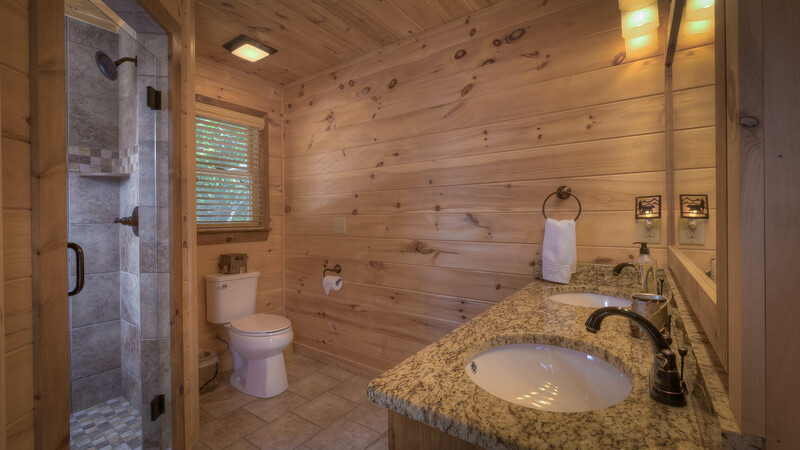 The separate bathroom here has a granite counter top vanity and a window for viewing the mountains, even while you shower! 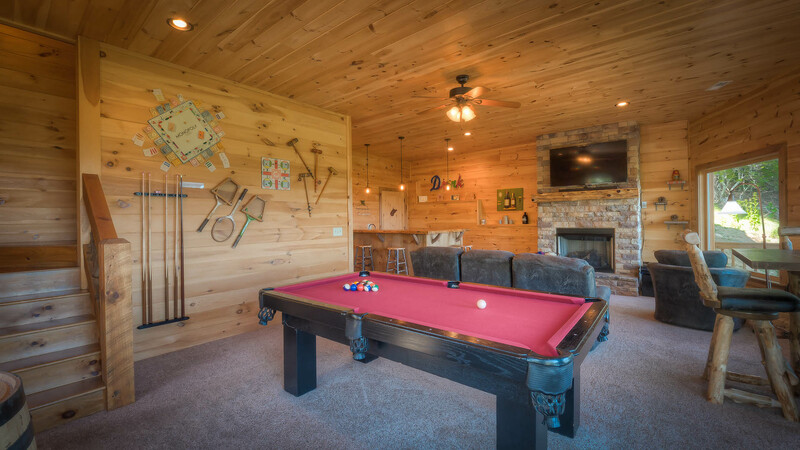 Ready for a trip to the game room and gorgeous custom designed bar? 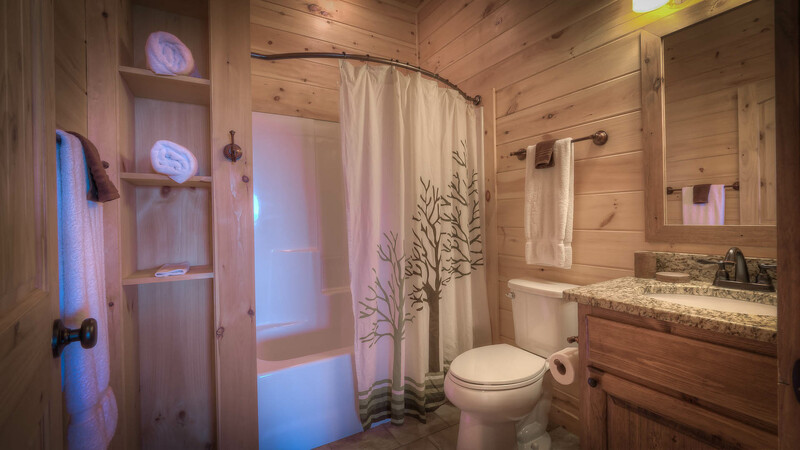 Take the stairs to the finished basement level which has an awesome pool table, the fourth bedroom and another separate bathroom. 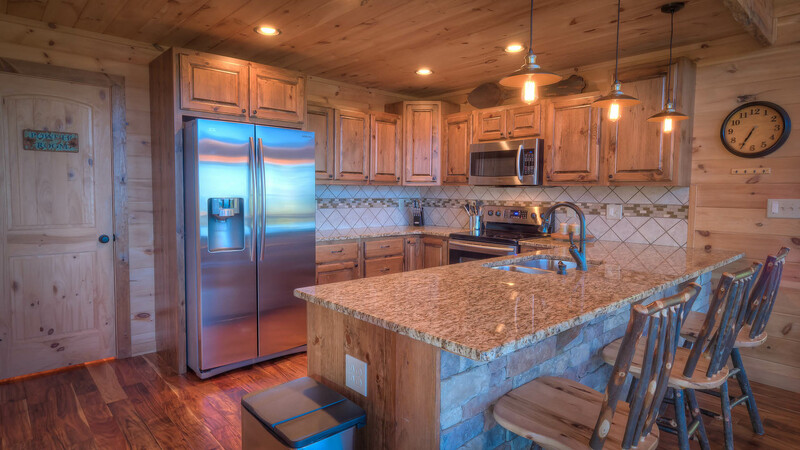 The wet bar has two adjoining counters; one log slab and one granite. 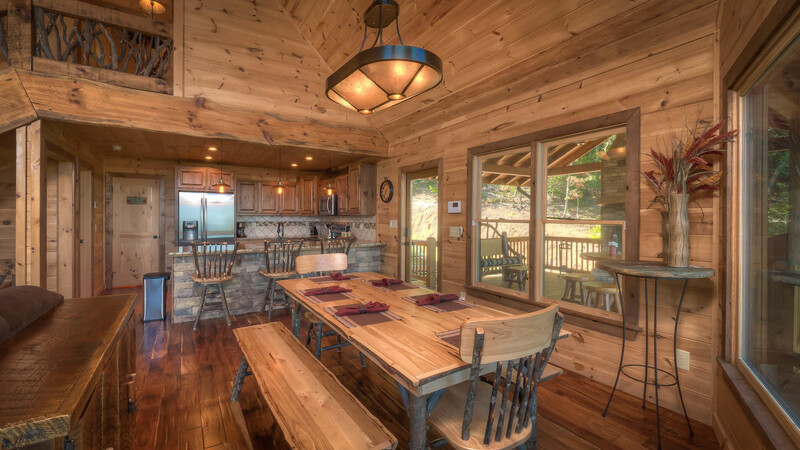 This is the ideal spot for entertaining guests as you have plenty of serving space and a mini fridge for chilling that champagne or cola. 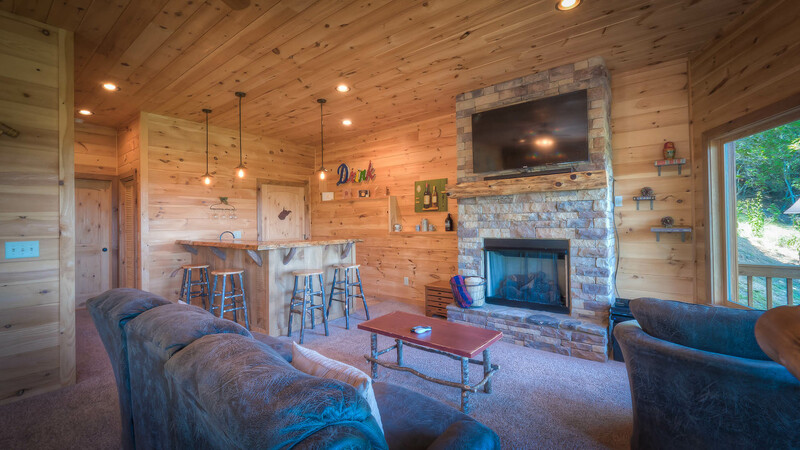 If you'd prefer something a little more cozy, cuddle up on the comfy sofa in front of the gas log stone fireplace and watch a movie on the large flat screen. 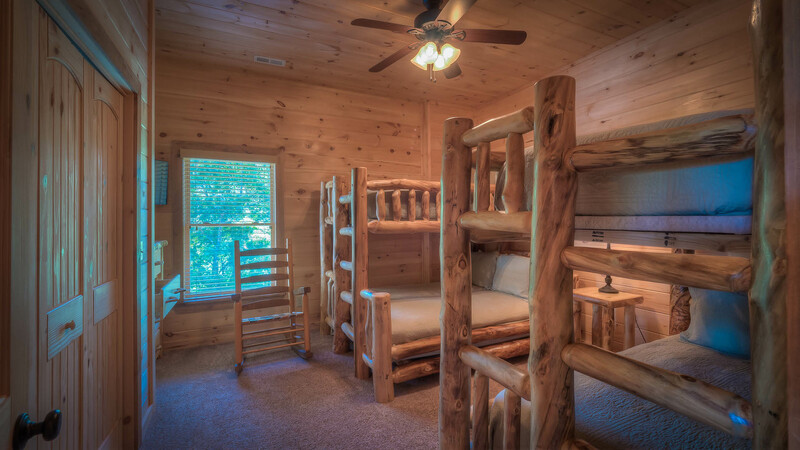 The 4th bedroom on this level has another flat screen television and has two sets of bunk beds. 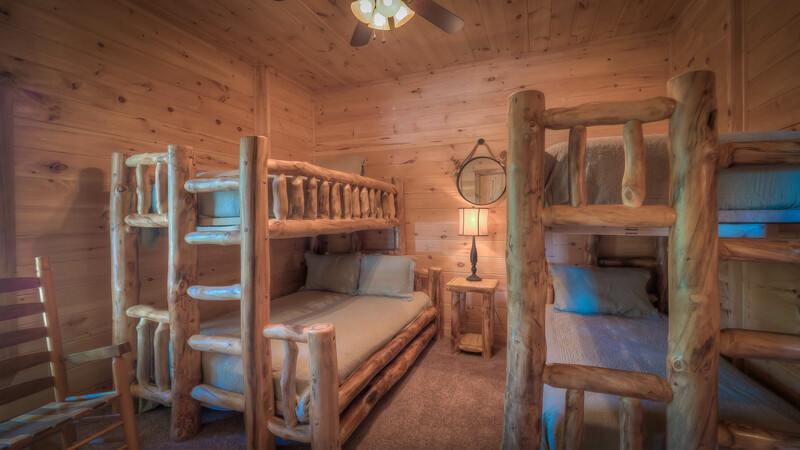 One set has a Queen on bottom, with a twin on top. 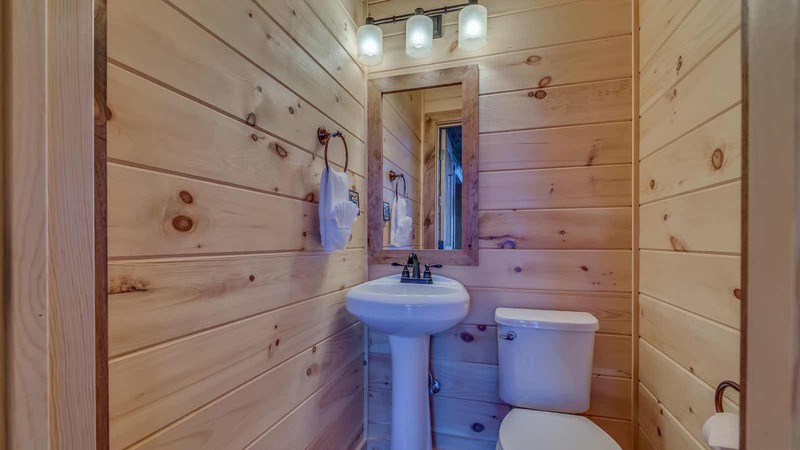 The other set of bunks is two twins The separate bathroom is just a step away, with granite counter topped vanity and a standard shower. 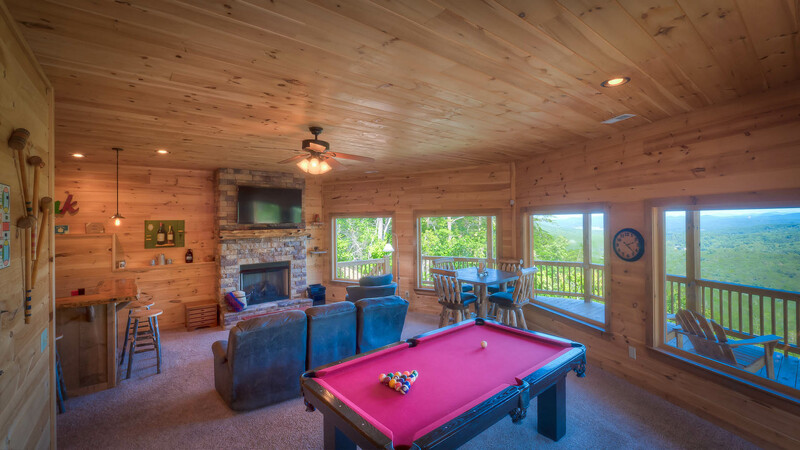 The X Box is also located with the gameroom television for the gamer in the party. 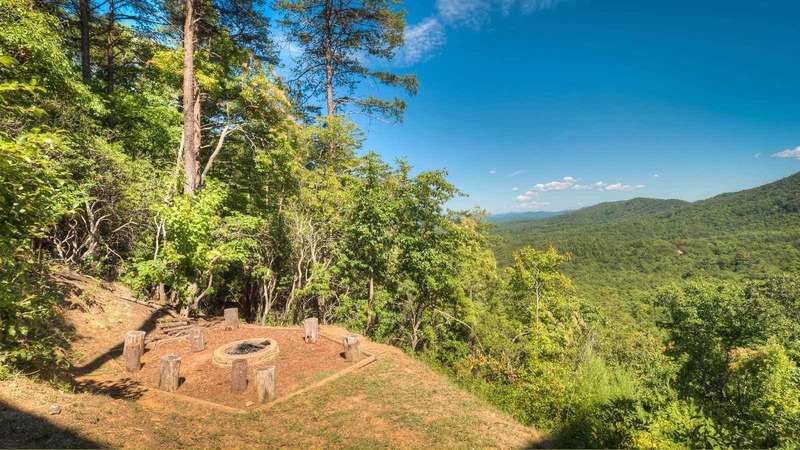 Don't forget about the outdoor fire pit or hot tub! 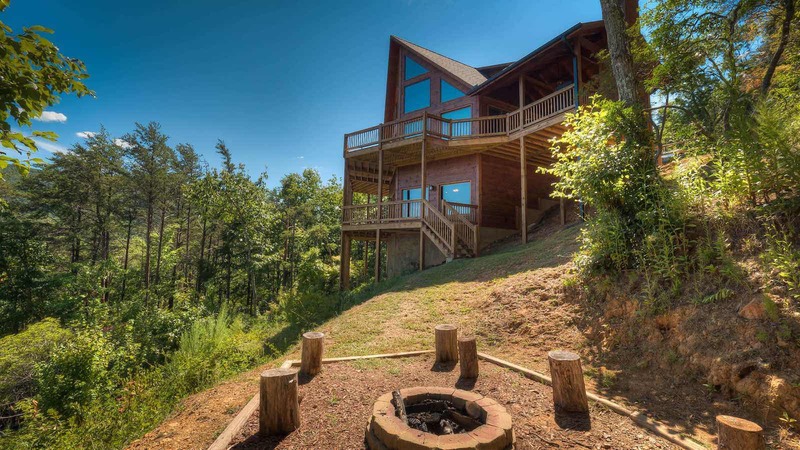 Step outside to the game room level deck for access to the fire pit and marshmallows over the fire or maybe a couple ghost stories? 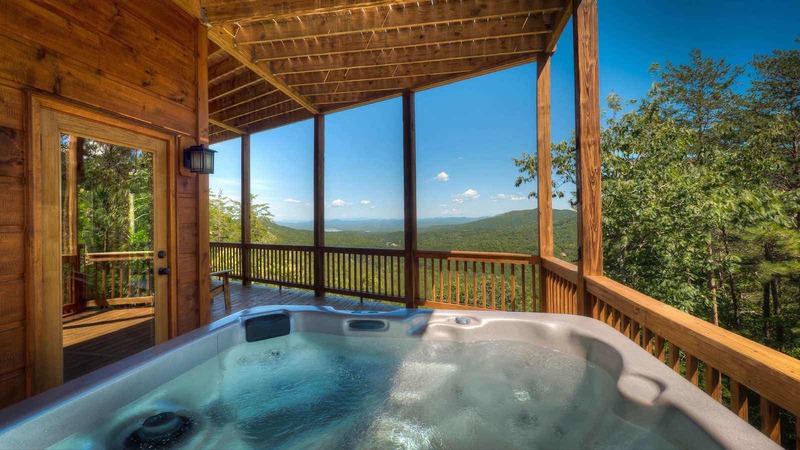 Have a soak in the relaxing hot tub, let the bubbling sooth your cares away while gazing across endless mountain views from the privacy of the hot tub. 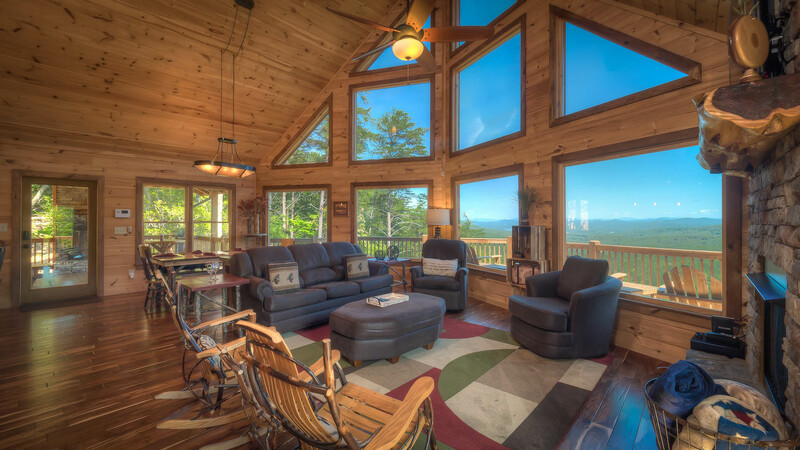 For those early risers in the party, Endless View Lodge is facing directly East and will boast a sunrise to inspire! 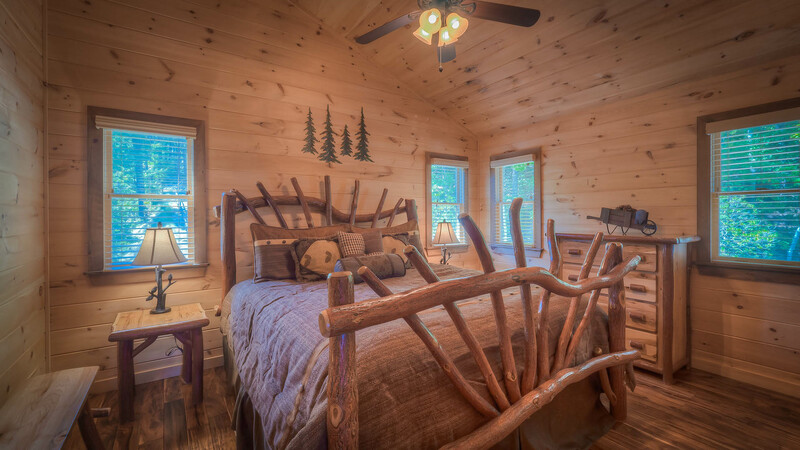 Are you ready to write your own fairytale? 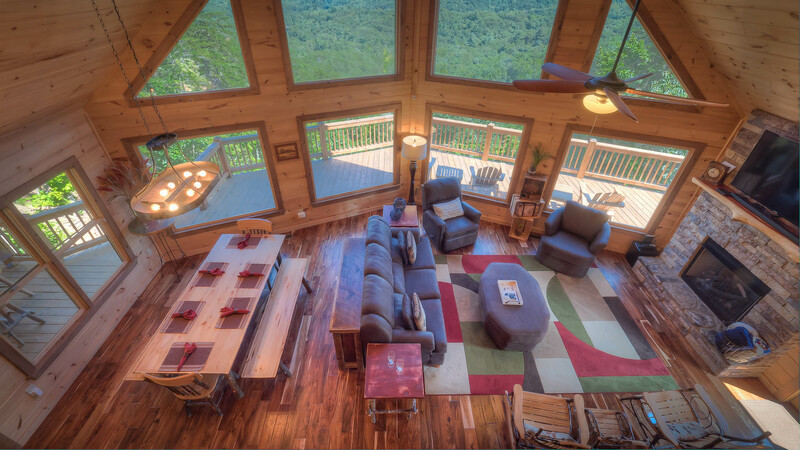 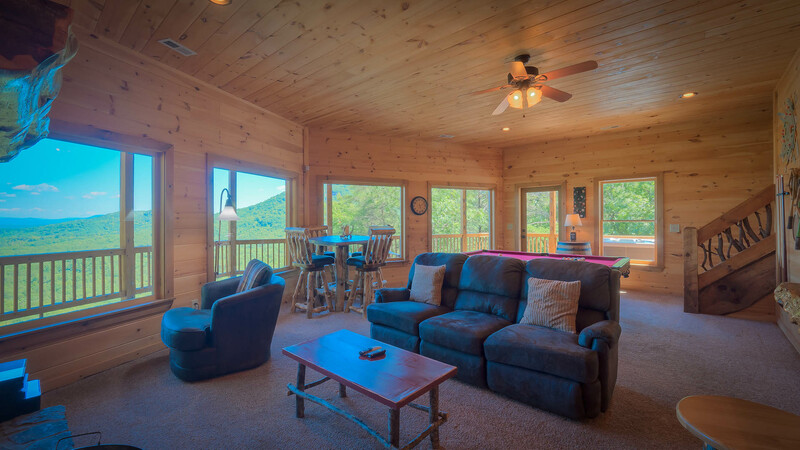 Reserve Endless View Lodge and get started making your dreams a reality! 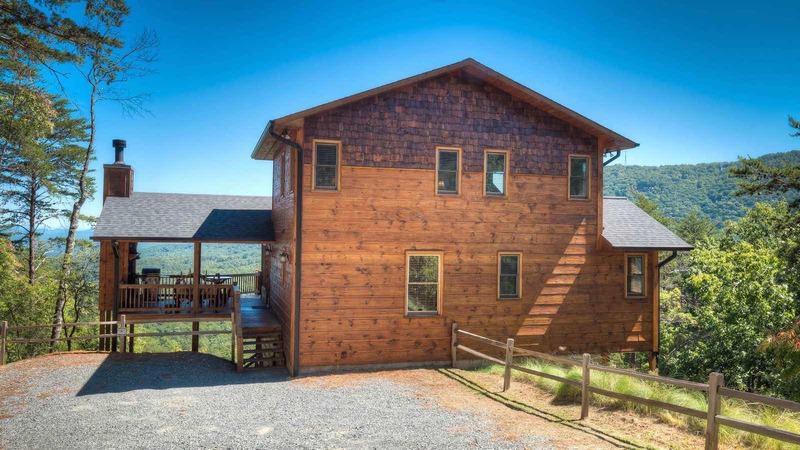 PLEASE NOTE: As described above, the last mile of the journey to the cabin is a steep one lane climb in elevation (Exactly .8 in length) and we require a 4x4 vehicle to access the cabin. 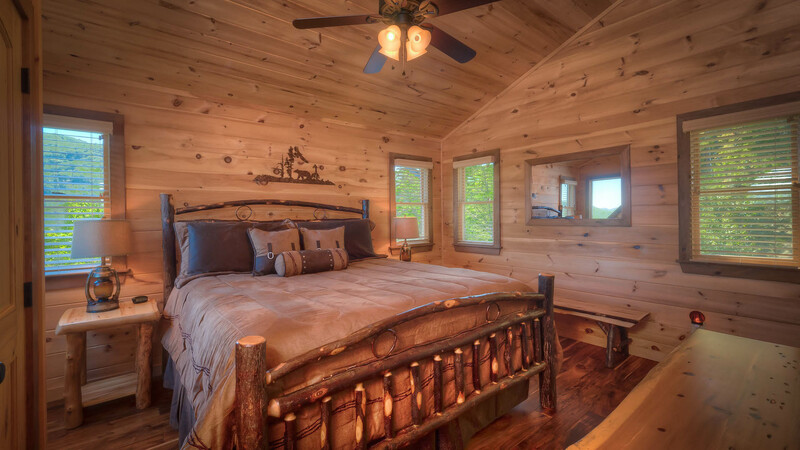 You also need to be comfortable and capable driving in situations that require 4x4.